Spectacular OCEANFRONT shore retreat in beautiful Stone Harbor. Wake up to the sounds of crashing waves and stroll out to the beach all summer long. Spend relaxing afternoons by the lovely landscaped private pool and enjoy a waterfront meal from the comfort of your own home. This very special home is LOADED with upgrades such as an elevator, two fireplaces, Wolf 6 burner dual oven range, Pot Spigot, coffered ceilings, transom windows, wainscoting throughout, and so much more. The hot water radiant heated Â¾ inch solid oak floors were finished onsite. Great detail both inside and out in this magnificent home. The exquisite window trimmings on the exterior of the home mirror the gorgeous molding around the interior side of the windows. 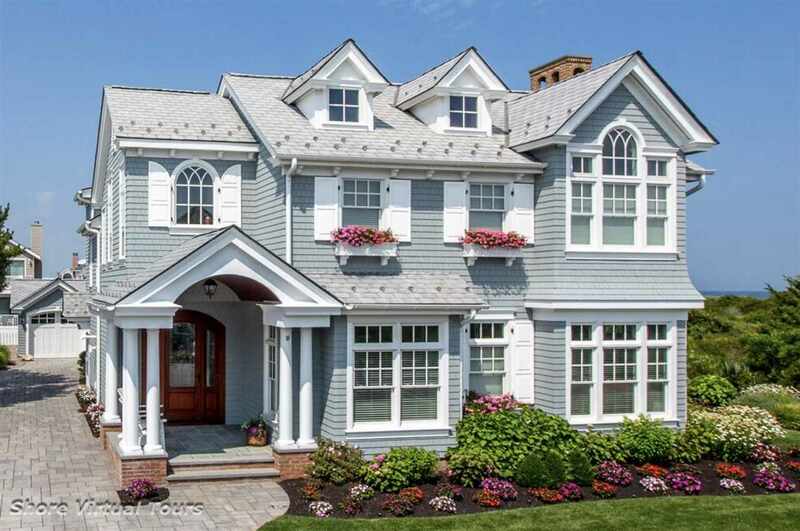 Arched windows with coordinating arched shutters, window boxes spilling with flowers, cedar shake shingle siding, slate roof, arched portico front entry with four doric columns are just some of the spectacular architectural details adorning the exterior structure. In the living/great room you will find truly magnificent coffered ceilings that distinguish this home from others. With various gathering spaces and multiple bedroom ensuites, this property is ideal for hosting and entertaining family and friends. The second-floor great room and chef's kitchen overlook sweeping views of the dune, beach, and ocean. The first-floor family room is just as luxurious with a superb built in wet bar and multiple gathering spaces for lounging or playing. The property's outdoor rooms are just as inviting as the indoor ones featuring a spacious cool slate covered patio, sunny decks overlooking the ocean, and a luxurious private pool area. The home's 5 bedroom, 5 full bathrooms, and 2 half bathrooms ensure that all your guests will have comfort, space, and privacy while visiting. With only 12 homes lining 15th Street, and its adjacent proximity to the Stone Harbor Bird Sanctuary, the 15th Street beach bordering this home remains quieter and more private than most. The professionally decorated furniture is included with this sale â a bonus allowing the buyer the ability to pack a toothbrush and some flip-flops and enjoy this special one of a kind oceanfront compound immediately. A must see for the truly discerning buyer â call for a showing appointment today.